I wasn't in the mood to blog the last days. I went to the dentist after more than ten years and, well, after three visits in two weeks the four bad teeth are gone. I'm still feeling kinda down and sick, but it can only become better from now on. At least I was able to eat normal food the whole time. Today I made fried rice with corn, prawns, king trumpet mushrooms and broocoli stem and decorated it with babybel two cheese stars. 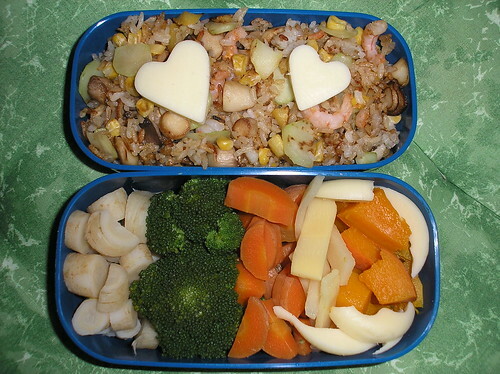 The other box contains parsley root, broccoli, carrot, bamboo shoots, red kuri squash and the rest of the cheese. In the weather forecast they said, today would be sunny and snowy. I looked out of the window and thought, snow? Not here. Not a single bit of white out there. But you can't trust the weather forecast here anyway. Especially the area around my village doesn't seem to care about the weather around. If it's raining in town (5km from here), there sometimes are just clouds. If you can hear thunder all around, it sometimes doesn't even rain here.